When a city has been waiting for a badly needed new subway line since 1929, public art is probably far down the list of expectations, well behind accommodations like a) working trains, b) lights and c) some means of entrance and egress. But when commuters descend into the new Second Avenue subway’s four stations, at 96th, 86th, 72nd and 63rd Streets, now set for a New Year’s Day opening — or perhaps a little later if things don’t go as planned — they will find one of the most ambitious contemporary art projects that the Metropolitan Transportation Authority has ever undertaken. The agency’s art department, M.T.A. Arts & Design, founded and first funded in 1985, is rarely — in a salmagundi system 112 years old — presented with a brand-new, blank canvas. But lately, with the opening of the superstation at Fulton Street downtown and the extension of the No. 7 line to a new terminus on West 34th Street, the subway’s art thinkers have been able to participate almost from the beginning in incorporating installations in tile work by leading artists into stations’ designs. If the effort doesn’t always result in stations that look like artworks themselves, as some of the best stations in Europe and Asia do, it has nonetheless put the aesthetic front and center again in a way that evokes the ambition of the city’s first subway stations in 1904, with their mosaics, faience and amethyst-glass skylights. Gov. Andrew M. Cuomo, who has taken an unusually personal role in the Second Avenue subway’s final push toward opening, casts the art in historical terms, as a clarion call for government to once again be a builder of inspiring public amenities and infrastructure. “At some point government adopted an attitude that its job was to build things that were functional but unattractive and unappealing,” Mr. Cuomo said in a statement to The New York Times. “But that’s not how it has always been, and it’s not how it should be. With every public works project, I believe there is an opportunity to elevate the everyday, to build a public space where community can gather and where culture and shared civic values are celebrated.” At a news conference on Monday at the Museum of Modern Art, he recalled an era of infrastructure development under Nelson A. Rockefeller and Robert Moses. “This is just the beginning of a new period of rebirth,” he said. What follows is the first subterranean tour by a reporter of the new subway’s art, created at a cost to the Metropolitan Transportation Authority of $4.5 million, out of an overall budget of $4.45 billion. Four artists were chosen beginning in 2009, from a pool of more than 300 high-profile applicants, to treat the stations as their very own and make them into individual installations. Sarah Sze, who represented the United States at the Venice Biennale in 2013 and who draws from the great modernist-magpie tradition of recycling that stretches from Kurt Schwitters through Robert Rauschenberg and Isa Genzken, decided to use the standard-size porcelain tiles that cover the walls throughout the new stations, rather than mosaic. For “Blueprint for a Landscape,” accomplished with the help of tile masters in Spain who applied color and line to the plain porcelain, she transformed the station into what looks like a deep-blue immersive drawing that unfolds down the escalators and through the concourse. Fragmented images of scaffolding, birds, chairs and leaves, digitally collaged, seem as if caught in a great whoosh caused by a hurtling train. 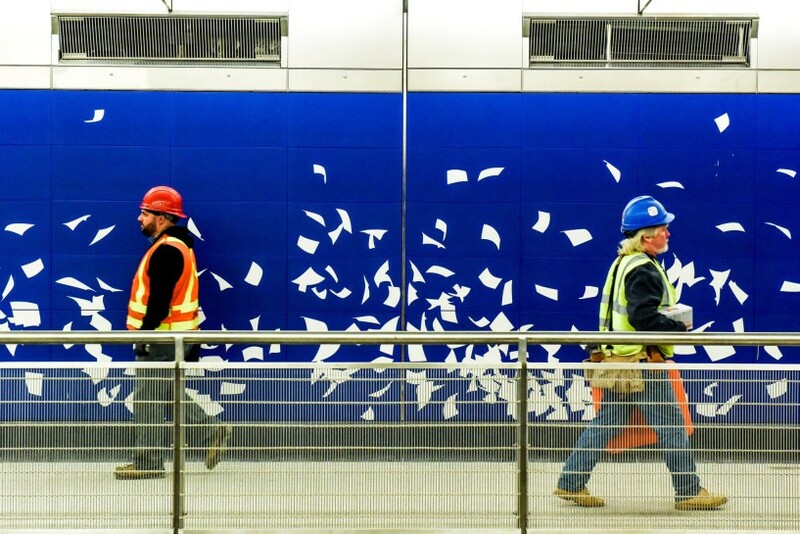 And on the concourse, in a nod to Katsushika Hokusai’s well-known depiction of travelers battling a gust, Ms. Sze (pronounced Zee) has used blue and white in an almost minimalist fashion to adorn the walls with images of blowing paper — dense at the station’s north end and sparser moving south, as a directional aid.